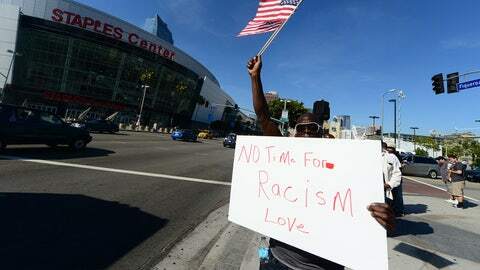 Demonstrators planning to denounce Donald Sterling outside Staples Center before the Clippers game Tuesday evening said they would instead focus on supporting the team after the NBA’s decision to ban its owner for life. 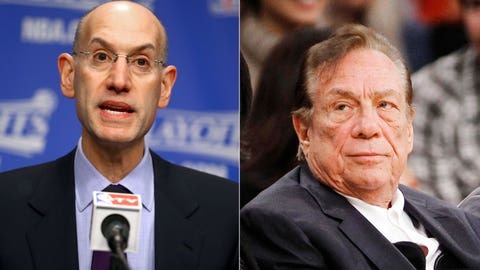 Organizers planned the rally — dubbed "Los Angeles is better than Donald Sterling" — to protest recorded racial attributed to the longtime Clippers owner. But after NBA Commissioner Adam Silver said Tuesday that Sterling would be banned as well as fined $2.5 million and possibly forced to sell the team, organizers of Tuesday’s demonstration said the tone of the event had changed. "We were able to get exactly what we wanted in three days," said Najee Ali, a civil rights activist. "Tonight, it’s not a protest, it’s victory celebration." Los Angeles police said they, too, hoped the decision would have a positive effect on the demonstration, which had been scheduled to take place at Figueroa Street and Pico Boulevard a couple of hours before the Clippers face the Golden State Warriors in a playoff game. LAPD Cmdr. Andrew Smith declined to specify how officers would be deployed, citing security, but said the department would be prepared. "We always hope for the best and plan for whatever eventualities occur," he said. "I think in terms of the crowd and crowd management, I think that the actions taken by the NBA today were a positive step for us in our planning." Earlier Tuesday, LAPD Chief Charlie Beck urged those planning on attending the demonstration to keep things peaceful and friendly. "The bad behavior by Donald Sterling does not justify bad behavior on the part of the community," Beck told reporters. "Let’s respect a great team, not a great owner. … Remember that it’s the guys on the court, not the guy in the owner’s box," who matter. Members from dozens of clubs planned to attend the demonstration, along with a "broad cross section of people from all walks of Los Angeles County," Jasmyne Cannick, a co-organizer of the event, said. "Donald Sterling’s comments do not represent Los Angeles and the millions of collective voices of minorities who call Los Angeles home," Cannick said, adding that together, "black, white, Latino, Asian and every other minority represented in Los Angeles will stand together and lift our collective voices in support of the players, the team and our city." The action came after the celebrity website TMZ posted an audio recording Friday that captured Sterling telling a woman identified as V. Stiviano that "it bothers me a lot that you want to broadcast that you’re associating with black people." In the recording, the people identified as Stiviano and Sterling argue about a photo posted on Instagram showing her with Magic Johnson. The remarks drew widespread condemnation, including from former and current players, coaches and even President Obama. More than a dozen sponsors withdrew their financial support from the team, and Clippers players and others wore warm-up jerseys inside-out in protest. The NBA also launched an investigation, which Silver said Tuesday had revealed that the voice on the tape was in fact Sterling’s. "The views expressed by Mr. Sterling are deeply offensive and harmful," Silver said. "That they came from an NBA owner only heightens the damage and my personal outrage." Sterling has remained silent on the matter. L.A. Mayor Eric Garcetti, Sacramento Mayor Kevin Johnson and other NBA stars — including Kareem Abdul-Jabbar and Steve Nash — gathered on the steps of City Hall on Tuesday to applaud the sanctions. "Today, we feel like justice has begun to be served," Garcetti said, thanking Silver for "bringing down the hammer" on Sterling. Kevin Johnson, a former NBA player and representative of the National Basketball Players Assn., also praised the action, saying it delivered "a statement about where we are as a country." "It doesn’t matter if you’re a professional basketball player, or a man or a woman who works hard for your family, there will be zero tolerance for institutional racism, no matter how rich or powerful" someone is, he said. Ali, the activist, said the fight was not over. "We still want the Clippers to be sold to an owner that is not a racist," Ali said. "The fight isn’t over with, but today was a major victory and a great first step."